As for which one of the new offerings from the big manufacturers is better, we’ll give you some info about them and let you decide. 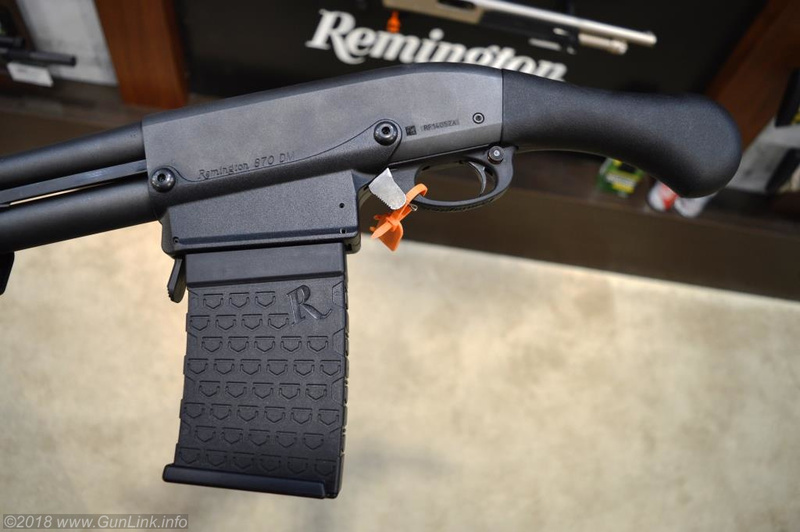 If you go by “first to market” rules, the new Remington wins, I suppose. 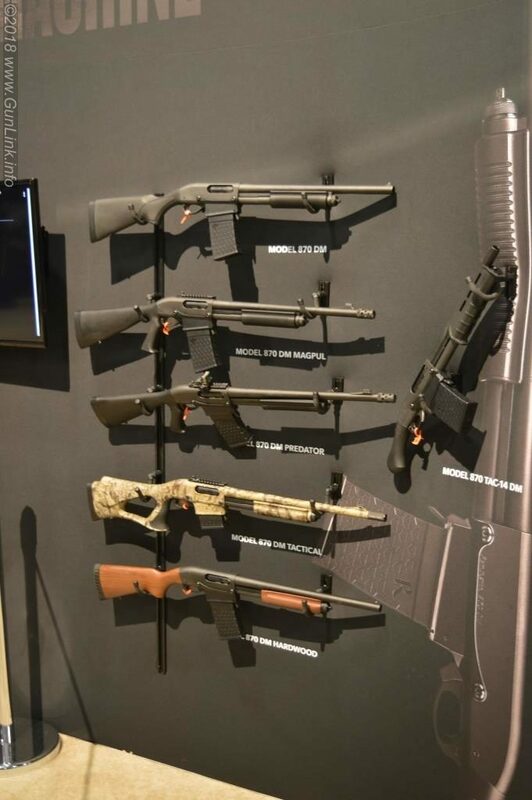 The 870DM launched a full line of variants in early December of 2017 amidst a completely organic whirlwind of internet buzz and speculation and a huge audience of viewers that totally weren’t just there to win a free gun. Likewise, if you are brand-loyal to Remington shotguns for whatever reason, you will probably put them in the win column. 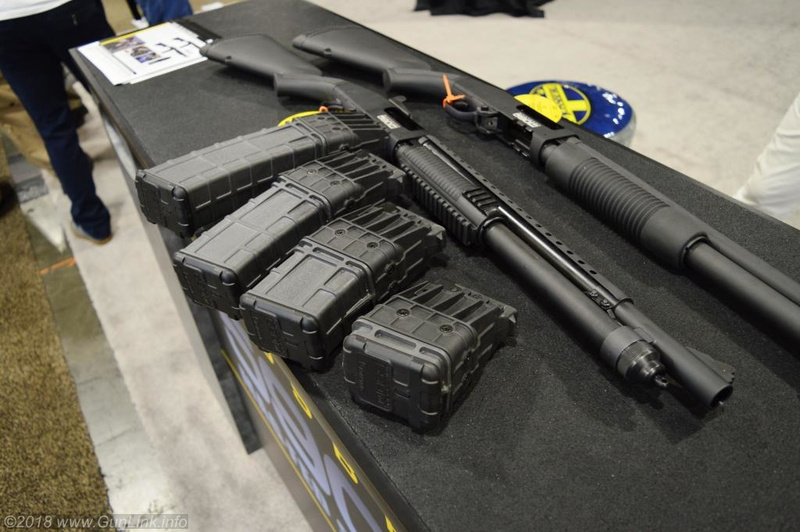 Truth be told, there does not seem to be a whole lot of new engineering, whiz-bang features, or black magic voodoo stuff going on with either of the offerings from these two – they are, at a high level – essentially just their parent firearms with magazine adapters bolted on. 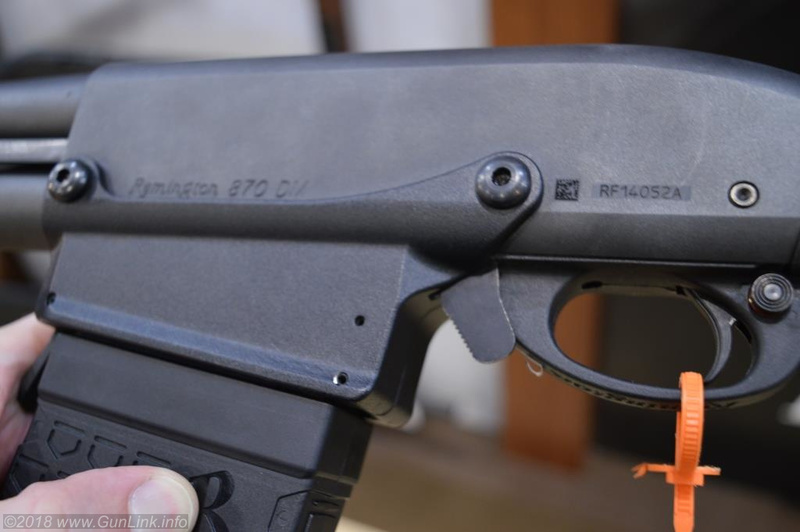 However, thanks to the changes to the receivers and internals, in neither case does this mean that existing 870s or 590s can be retrofitted with an upgrade to accept magazines. As such, most of the the controls on the 870DM are exactly where you would expect them to be if you are familiar with the 870 platform, like the safety, fire controls, pump mechanism, and so on. 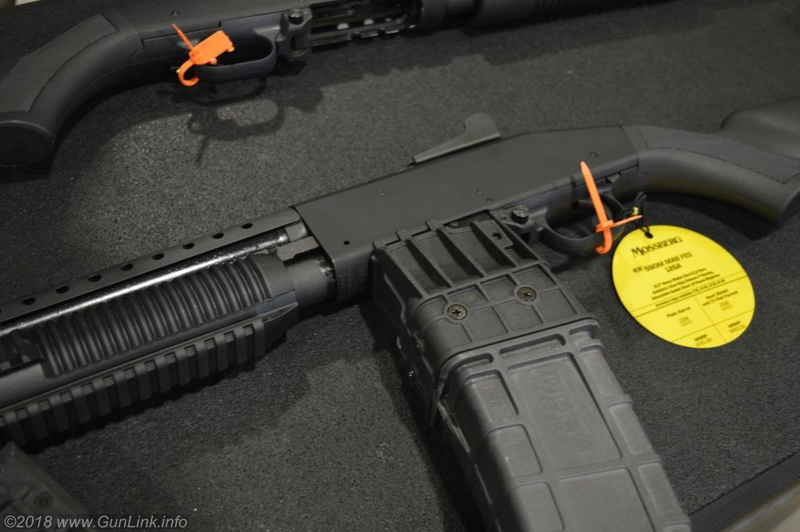 The action lock is in the same place, but the lever itself has been fattened up a bit to make it easier to access since it is now wedged between the trigger guard and the magazine well. 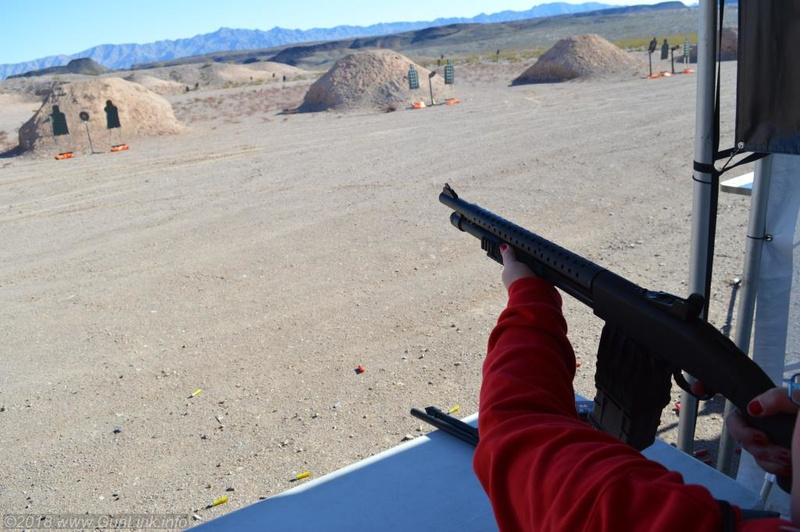 While our team did not get any live fire practice with the new shotgun at Range Day, we did get to participate in the in-booth Quick Fire contest consisting of loading and dry firing the 870DM with dummy rounds, performing a mag change, and shooting more rounds. The single stack magazines, which Remington is producing in-house were easy enough to load and seated in place just fine. The first magazine in my run-through fed flawlessly and the mag change was smooth. However, the second magazine did experience a feeding issue that required some prodding to rectify. On the topic of Remington’s proprietary magazines, they are currently available only in three- and six-round capacities. If they have any plans to make extended magazines, they aren’t spilling the beans. On the upside, as long as they keep production up, owners can stack them deep at $35 each. 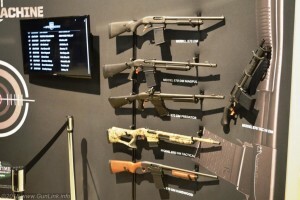 At the product release, we mentioned that we were worried about the placement of the magazine release – a big lever at the front of the magazine well – and how it might get nudged during operation of the action. While none of our shooters actually activated the mag release during firing, we could position our hand during cycling such that it did contact the lever. While the magazine did not drop free when we “accidentally” bumped the release, we were able to create a situation where it came loose enough to work free under continued cycling. Having it stick out so far is still a concern of mine if using the 870DM under stress or packing it in the woods for hunting where another object could hit it. 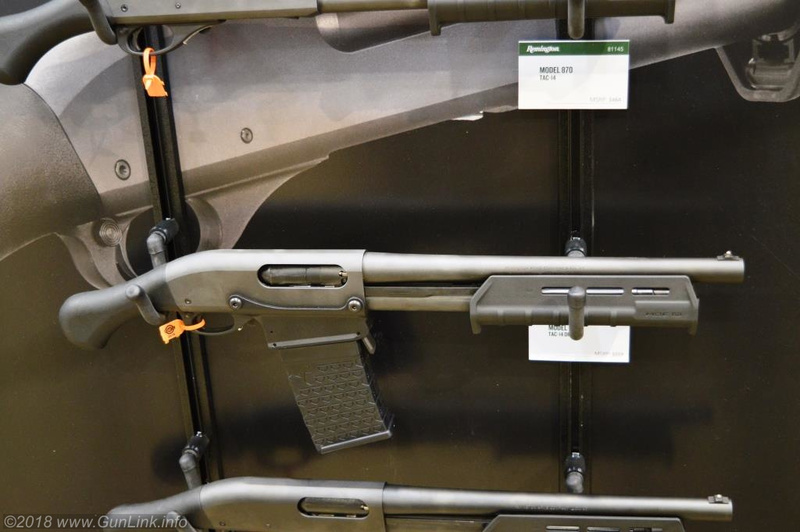 Remington had a number of their 870DM models available to check out in their booth, including the cool-factor-of-11 TAC14 model with a 14″ barrel that skirts AOW classification with a 26″ overall length. Also, while it wasn’t one of the DM variants, Big Green also had a TAC14 model with hardwood furniture that just looked and felt fantastic. The added weight really improved the overall impression that the stubby 12ga, which I otherwise consider to not be much more than a toy, gives off. 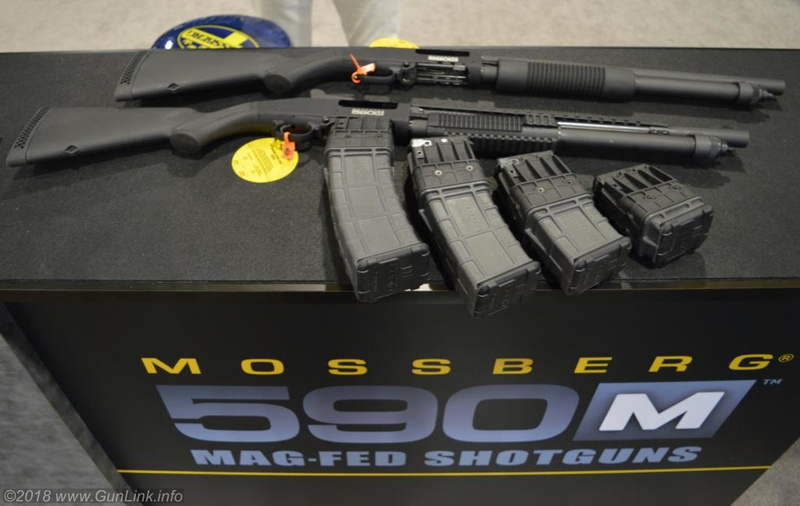 While the other guys opted to create a big fuss with their release last month, as far as we know, SHOT Show 2018 Industry Day at the Range was the official launch of the 590M, so discovering it on the firing line was pretty exciting. 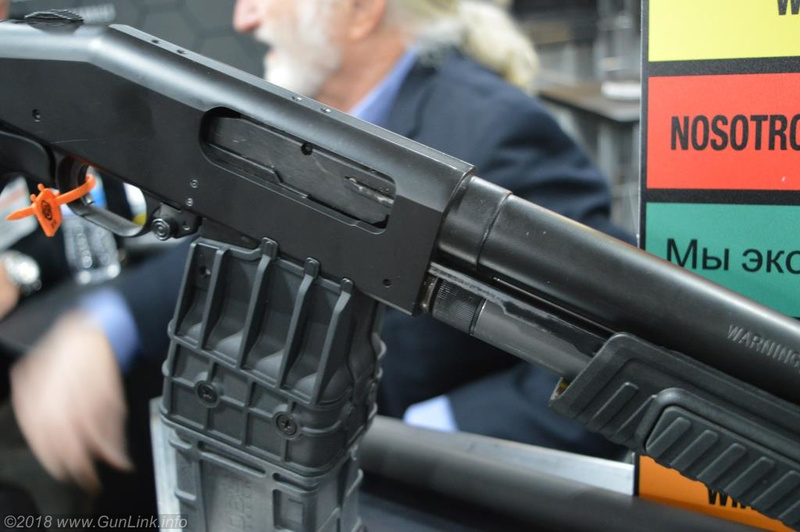 Like its Remington counterpart, the mag-fed Mossberg’s conventional controls are all pretty much where you expect them to be. 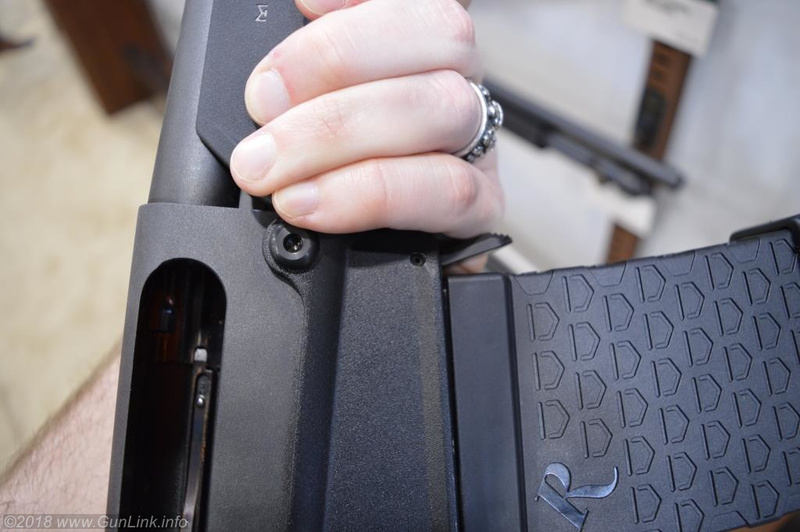 Since the action lock release is tucked behind the trigger guard, the addition of the magazine did not require making it oversized to access it. Aside from the typical differences between the 590 and 870 platforms, the main difference between the two is the magazine design. 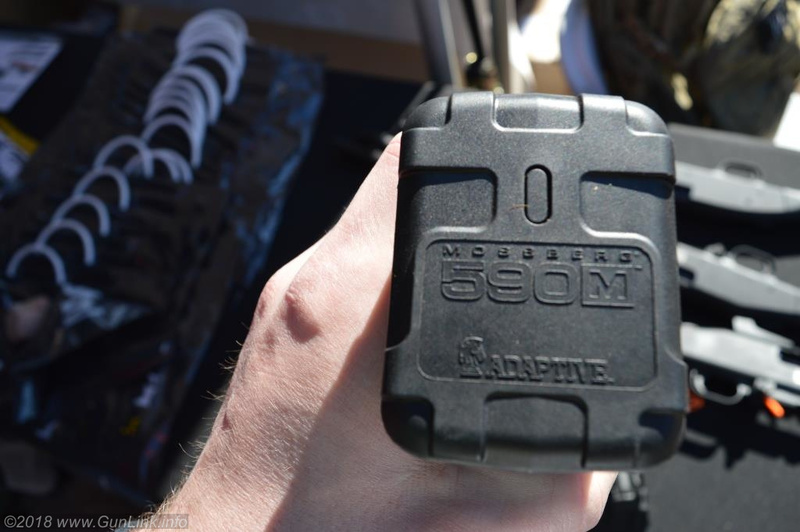 Rather than making them in-house, Mossberg has partnered with Adaptive Tactical for their magazines. 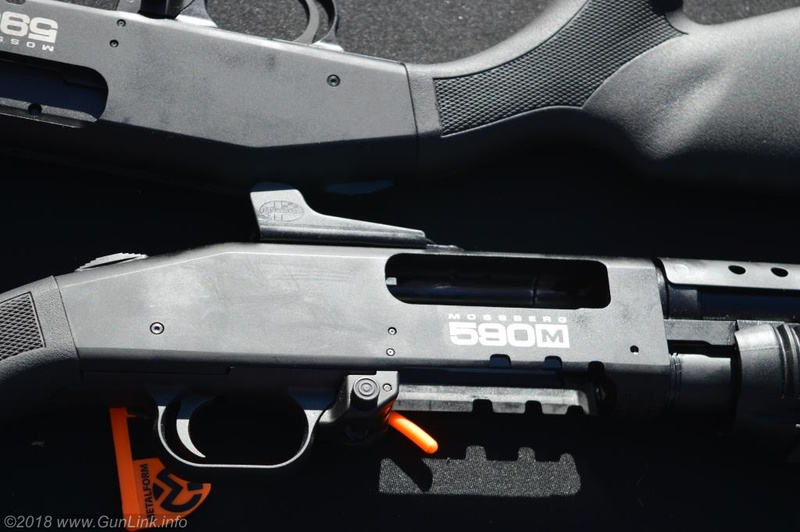 Instead of a single-stack metal design, the 590M takes polymer double-stack magazines that taper down to steel feed lips. 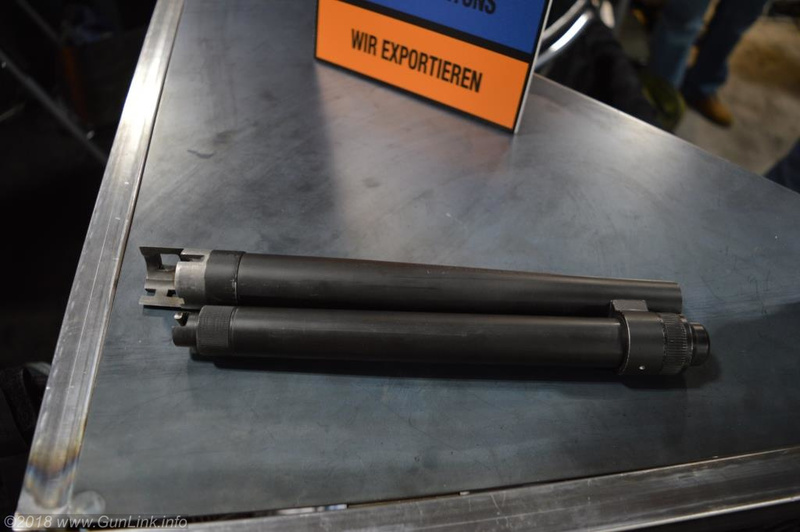 The magazines are a modular design, all sharing the same business end with different sized bodies bolting on to give 5-, 10-, 15-, and even 20-round capacities. 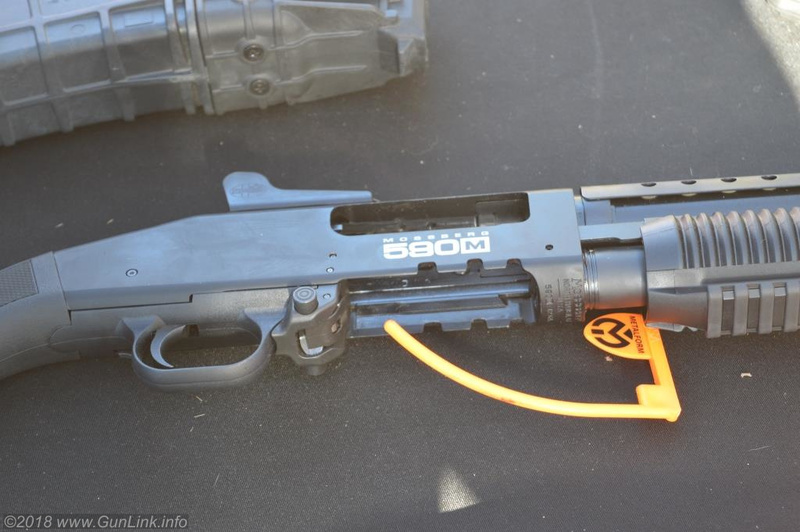 The 590M does not have a magazine well, as such. 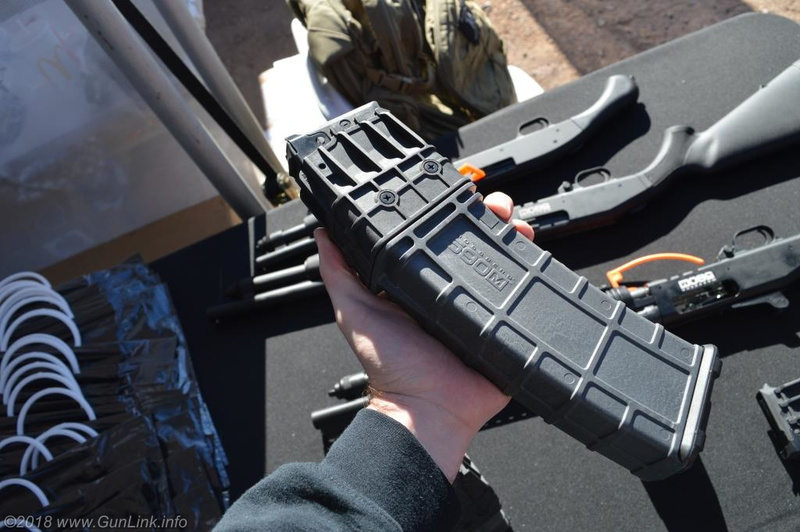 Rather, the magazine locks directly into the receiver, rocking into place similar to an AK magazine. The magazine release, however, is more a more traditional (and ambidextrous) push button just forward of the trigger guard. 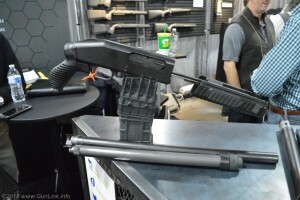 Since they are double-stacked magazines, the 590M magazine length does not grow with capacity as quickly as the 870DM magazines do, although they are a bit bulky – it wouldn’t be out of the question to add nearly 100 in³ worth of magazine below the shotgun. On top of the bulk, the other downside of these magazines is the price tag, which checks in at triple the cost of Reminton’s or more, with the little ones starting upward of $100 each. One final thing to note on the 590M is the longer action bars which draw your support hand and arm out further when manipulating the action. With the standard stock on the firearms at Range Day, our female shooter had trouble with cycling the Mossberg with her T-Rex arms. 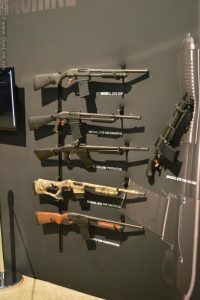 While they are not yet available, shockwave, SBS, and AOW versions of the mag fed shotguns seem to be the next logical step for the platform. 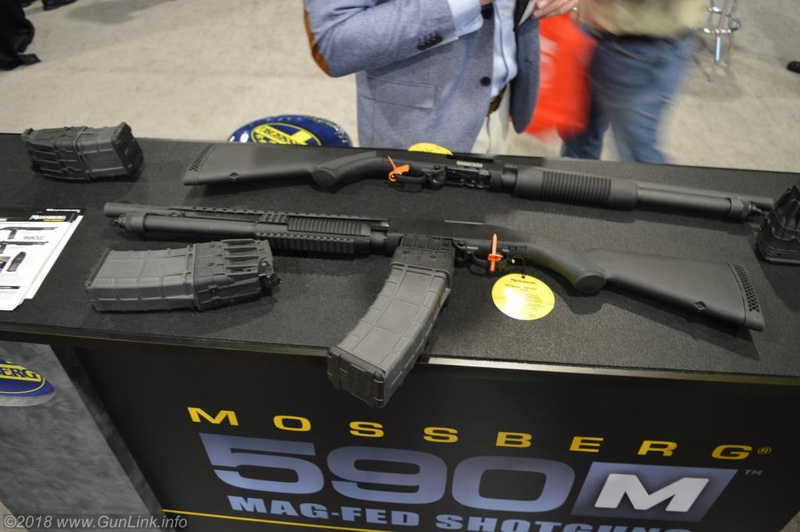 Although they would not confirm nor deny that it was coming soon, the folks in the Mossberg booths gave a wink and a nod along with their “gee, I don’t know” routine. Since the magazine tube is now a vestigial organ of the box-fed firearm, acting only as a rail for the forend to slide on, Adaptive Tactical took the opportunity to use it as an attachment point to create a takedown magazine fed 590M! Using their special “magazine” tube and an adapter that screws into the receiver, with a few twists, the entire barrel/tube assembly comes off for quick storage or transportation. Because that wasn’t cool enough, they even had an SBS version of it. So, which one do you think comes out ahead? Let us know below. 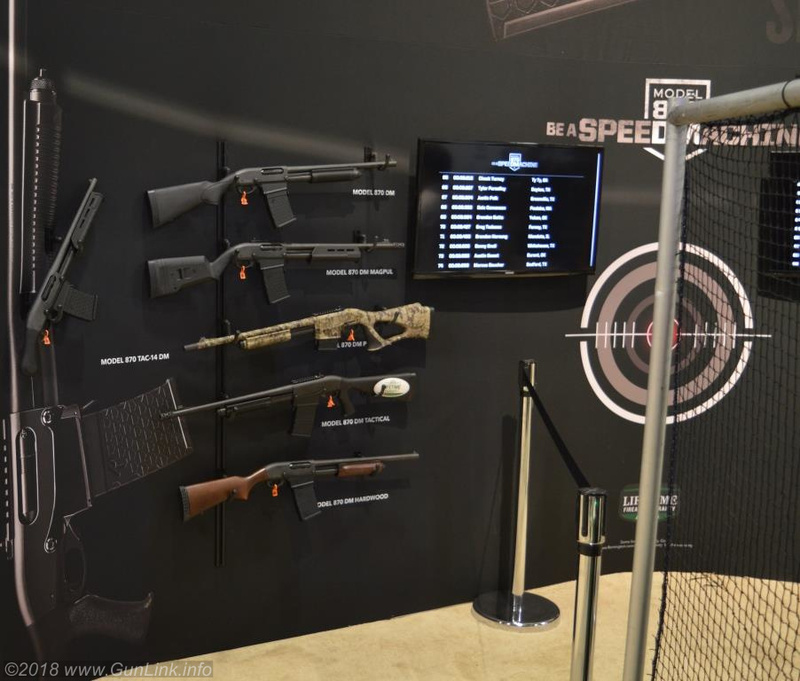 This is a part of our ongoing coverage of what’s new from SHOT Show 2018 in Las Vegas, made possible in part by our coverage partners, including Shot-Force Pro AR500 targets, Sticky Holsters, RepackBox ammo storage boxes, and Gunz Incorporated. Be sure to check them out. to find out more more about our coverage partners, click here. 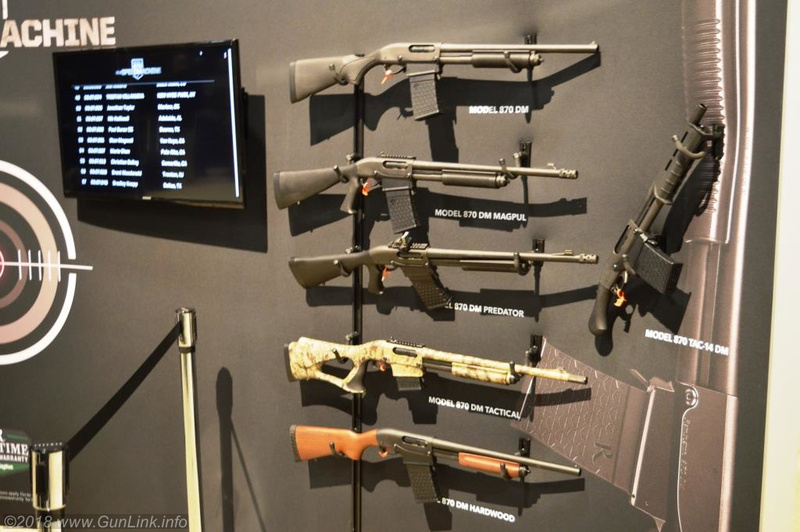 To see more from SHOT Show 2018, keep watching right here and on the GunLink Forums.